Doctor Richard Kortokrax has been practicing dentistry and serving his community for the last 33 years from his office located in historic downtown Madison Indiana. The unique architecture of his dentist office has always presented challenges in staying leak free. The structure features a round entry porch where patients enter and directly above the entry way is round turret. The main body of the office is covered with roofing shingles that lead into box gutters but there is also a second story area that has a flat roof. Dr. Kortokrax has made three previous attempts to repair the box gutters and water proof the area around the turret but each time the leaks return. The last attempt at stopping leaks was done so with EPDM rubber roofing and all along the outside edge of the decorative trim under the box gutters and radius porch a silver termination bar with screw heads were visible. The area around the porch had begun to leak and the area behind the turret also had leaks that had begun to damage interior walls. One of our main considerations for this project was to water proof the dentist office in a way that would function long term but also in a way that did not detract from the look or appearance of the building. We knew that we could water proof the box gutters and flat section of the structure with a PVC membrane called Duro-Last. Duro-Last also has metal trims that accompany the commercial roofing system. These trims work great on the outside edge of walls, box gutters, and on porches and entry ways. Duro-Last can also make custom radius flashing that would normally be installed in commercial or industrial roofing setting around a large stack flashing. We decided to use a custom stack flashing to water proof the turret. 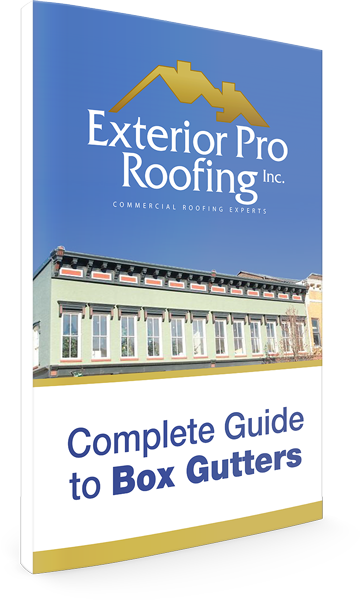 Line box gutters with Duro-last and use 2 pc. compression metal instead of termination bar to add to structures appearance. Install custom sized drain flashing into down spouts to eliminate leaking through box gutters. A solid plan for the job was establish and discussed with Dr. Kortokrax and his spouse and they agreed to move forward with the project. Their only concern was the ability of their patients to enter and exit the dentist office safely while the roofing project was underway. The job required 4 skilled Duro-Last installers from Exterior Pro 3 1/2 days to complete. The turret area and replacing the roof shingles around it took the majority of time and effort of the crew. 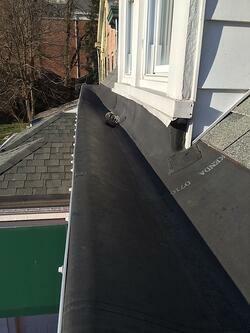 The box gutter lining was straight forward and went as scheduled. 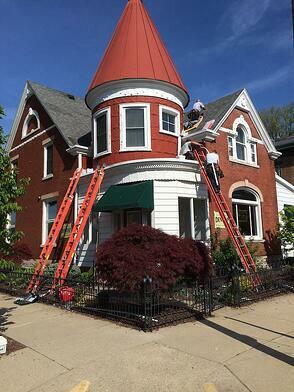 Doctor Kortokrax can continue to serve the Madison Indiana community without worrying about leaks in his office for many more years thanks to the roofing crew at Exterior Pro and PVC roofing manufacture Duro-Last.